So yesterday - in a typical bout of deep thought - I found myself questioning (for the first time ever) whether cats purr in Heaven. And if they do, why? I mean, since it seems that cats purr on Earth mostly to express contentment, wouldn't it be redundant, or wasted energy, for them to purr in Heaven? 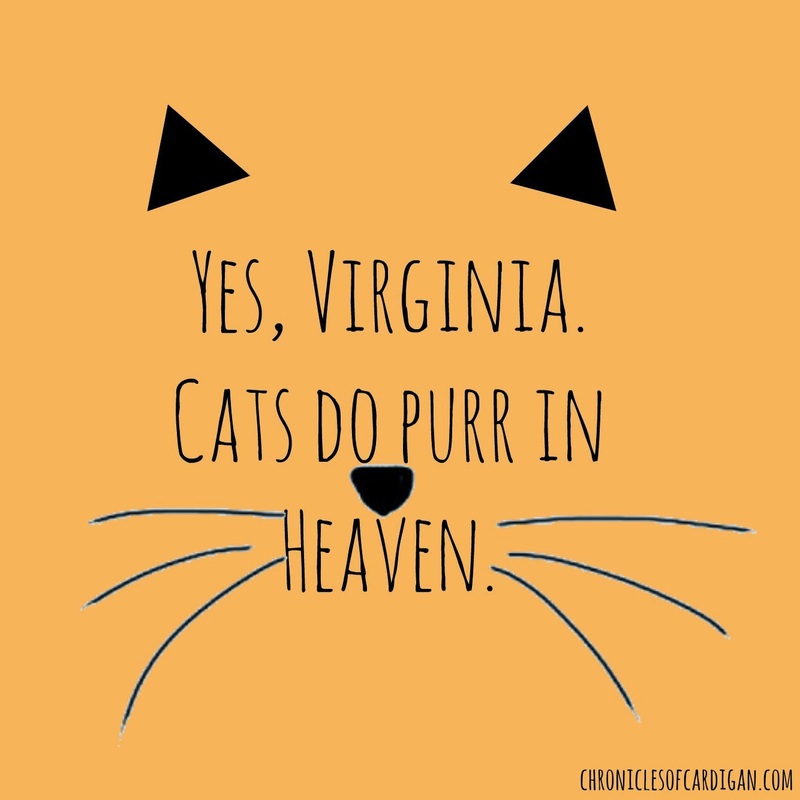 Because, duh, it's Heaven, and they'd be purring non-stop! But before I could get all sad about not wanting to go to a Heaven without cat purrs, I told myself to step back and consider the question from another angle: maybe cats purr because they're happy on Earth, but for some other reason in Heaven? Then I looked over and saw Maddox, and thought, Maddox doesn't purr a whole lot, but when he does he gets all into it, with gurgling noises and kneading...and then, I thought of my new t-shirt that shows a kitty baking bread, and I thought, GREAT SCOTT, THAT'S IT! Cats purr and knead when they're happy on Earth (due to memories of their mama's milk bar, I suspect), but in Heaven, cats knead and purr BECAUSE THEY'RE MASTER CINNAMON BUN BAKERS! SQUEE! Yes, that had to be it! Cats purr in Heaven while they knead the bun dough! (Think about those dwarfs whistling while they work!) And even more, because it's Heaven, cats' breath will no longer smell of tuna, but of vanilla icing, and they won't need claws or teeth, nor will they shed (but they'll still look the same, just a little fluffier, like unicorns) and EVERYBODY will love them, because in Heaven, everybody loves warm, kitty-made-with-love cinnamon buns! Oh, and then I remembered that my Maddox (like lots of other cats) has extra toes on his paws (polydactyl), and was like, OH MY GOSH! 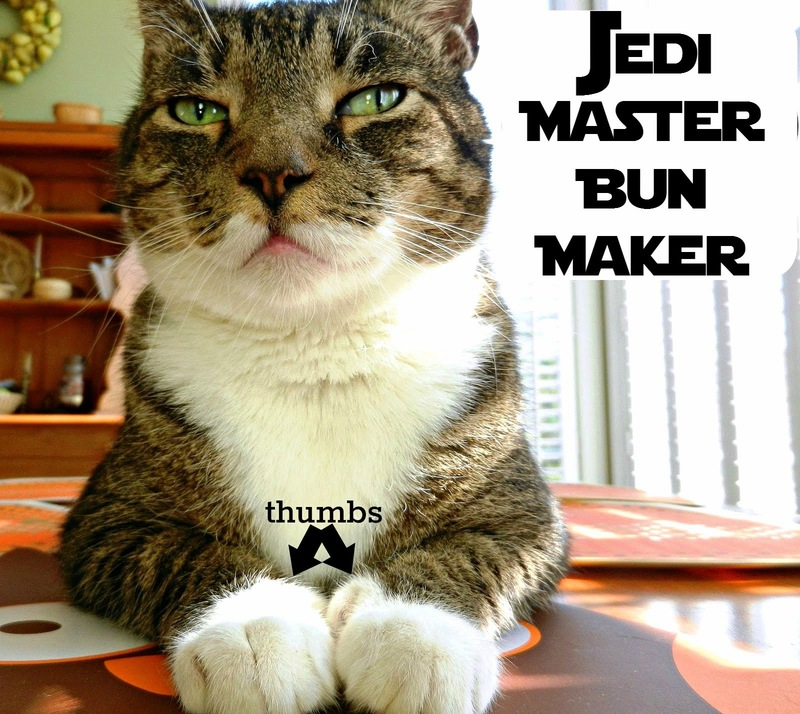 Polydactyl cats, in Heaven, are like Jedi Master bun makers! They're the cats in charge of teaching all the standard, 5-toed kitties how to knead cinnamon bun dough to angels' standards! And, you guys, the stars (might have) aligned in the East and it all made perfect sense! Imagine how soundly I slept last night! 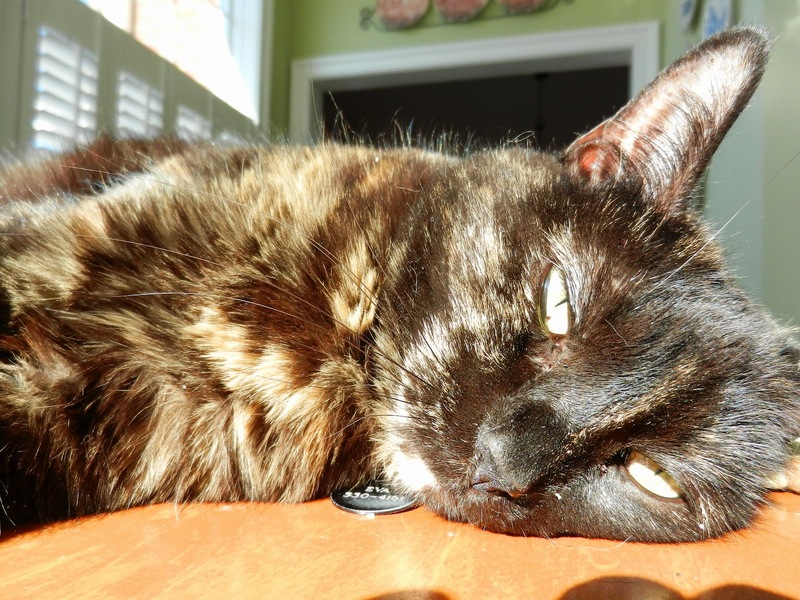 This post is dedicated to the life and memory of my dear, sweet Eva kitty, whom my family unexpectedly lost last week (from what was likely advanced lymphoma). I wrote about it on Facebook, where you can find more details. Three years ago, I wrote another post about Eva; her purrs were top-of-mind that day, too (though for different reasons). It was, and remains, a celebration of my unlikely bond with this cat. Here it is again, in its entirety. Thank you for celebrating Eva with me! We (I) rescued Eva a few years ago from a life on the lam. She showed up on my front porch out of the blue one day, covered in ticks and half-starved. She was far from reciprocal of my attempts at friendship, but grateful for a meal. For weeks after taking her in, I agonized that I'd made a HUGE mistake in keeping her. She never came out of the basement except to eat, and she distrusted (and therefore, treated with disdain) every human in my house. It was awful. But then slowly, after - I presume - she began to view us (especially me because I'm the one who was with her most of the day) as not threats so much, but colony members, she made more and more appearances and even allowed some limited handling (meaning, only from the front and only her head and neck). Weeks and months passed, and so did Eva's penchant for lonely basement living. And while she still preferred to see the human's hand before it made contact with her fur, once it did, she clearly enjoyed it, narrowing her eyes and belting out choruses of idling lawn mower engines in the distance. Not to her empty bowl. Not to the pantry where the cat treats are dispensed. Not to the couch where the bowl of ice cream I'd just finished would be placed on the floor for her licking pleasure (yes, I do). Because on that day, in that moment, all she (this borderline-feral, emotionally-scarred animal) wanted was me. On a typical morning around here, the cats curl up in their favorite out-of-the-dogs'-reach place and nap for a good two-three hours. When I opened that door today, Eva raised her head in typical fashion, had a good stretch and was eager to participate in the morning's activities (eating, cat box-visiting and self-grooming in a sunbeam, in that order). So today, like most days, she made her way to the kitchen - where the dogs eagerly awaited their after-breakfast snack. However, unlike most days, she didn't keep to the rest of her routine. You see, while the dogs were still frolicking in the kitchen, I'd made my way back down the hall to my bedroom. I almost got there, too. But then, I heard the bell on the cat's collar, then galloping footsteps, and just as I was about to cross the threshold of my bedroom door, she flew past me in a blur of black fur. And when she turned, flashed me a look of adoration that beckoned like a magnet to steel. Eva'd returned to the very place she'd just eagerly left. However, not for food nor water. Not for an after-dinner grooming session, nor to satisfy any other cat-ly need. It was simply because it was where I was going. Because today, in that moment, all she (my borderline-domestic, cherished family pet) wanted was me. So, I shut the door behind us and held reverie in the chorus of idling lawn mower engines in the distance. Wonderful post. As always. I'm so sorry about the loss of your kitty darling. It's awful when they go. Just awful. Jedi Bun Maker. HA HA HA HA! Thanks, Laurie. I know you understand. :) I'm just so thankful she got to let her fur down and be a regular cat (maybe a little diva) for the latter part of her life. She was in such bad shape when we found her. So sorry to hear that your Eva passed. Always sad when a pet goes. Now the part about the Jedi Master Bun Maker was actually a cool thought! So, so terribly sorry to read that you've lost Eva. No doubt in my mind that she is purring in heaven and remembering her life with you. Sending hugs. So sorry to read about Eva. We send you gentle hugs from across the pond. Lovely post (well, you know I love your cat posts the best anyway). I never knew Eva's story - very touching. And any post with Maddox is a bonus. He looks every inch the Jedi Master here. I tend to accept that in Heaven we will be happy, and the things that make us happy will be there. You worry about extra expended energy.. well I don't really think that will be an issue. If you and your cat are there, the cat purring will make you happy.. so the kitty will purr because it is happy.. or you won't even remember purring and you will connect on a whole different level we can't even comprehend.. *shrug* I tend not to think about it to much, I just know it will be good.